Introduced to satirical art through his apprenticeship with Trinidad Pedrozo, José Guadalupe Posada (February 2, 1852 - January 20, 1913) gained exposure and experience with lithography in the 1870s. Due to the radical nature of Pedrozo’s work, Posada was forced to flee to the city of León, but they set up another print shop there. Both Posada and Pedrozo gained local acclaim for their lithographic works, but Posada eventually left to work on his calaveras, or skulls. Posada’s works were only recognized after his death as he was constantly in trouble with various authorities. In 1920, Jean Charlot recognized the high craftsmanship and significance of Posada’s calaveras and brought them into prominence. Many of Posada’s calaveras are satirical, criticizing the deeply engrained social inequality of Mexican society during his lifetime. In using calaveras as a metaphor for the emotional strain of inequality, Posada can be classified as an early Expressionist. La Calavera Catrina is widely used in Mexican Day of the Dead imagery, especially after Charlot took an interest in Posada’s work. 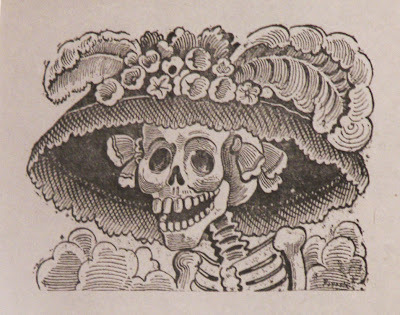 This calavera depicts a woman with a large fancy hat, but is meant to be symbolic of the fact that any amount of wealth does not stave away death. This commentary on economic inequality reflects Posada’s tumultuous history with Mexican authorities. Calavera de Madero also satirizes the upper class, focusing on the specific historical figure of Francisco I. Madero (1873-1913). Madero was an upper-class lawyer who served a brief stint as President of Mexico for two years after the fall of Porfirio Diaz. He was unable to address the problems raised by the Mexican Revolution and was assassinated at age 39. 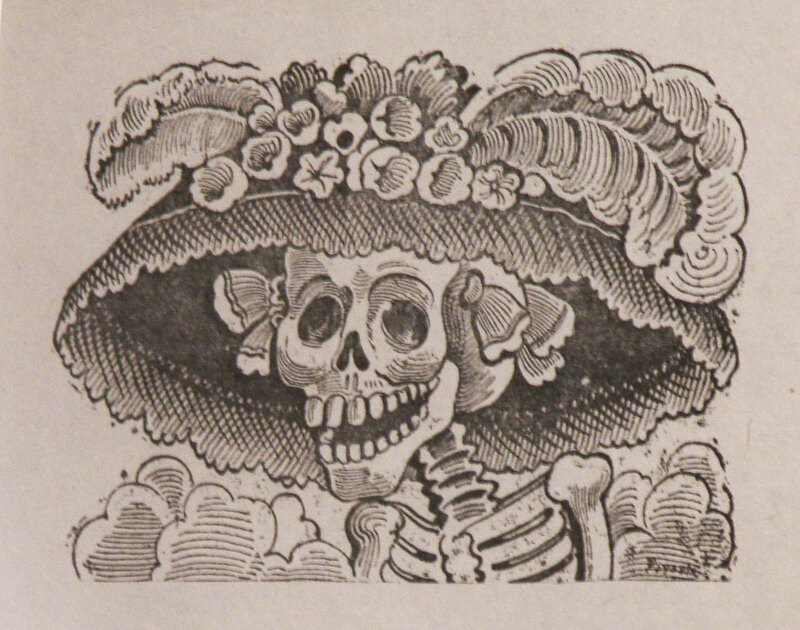 Calavera de Madero and La Calavera Catrina are both typical examples of Posada’s detailed lithographic style and satirical nature. They’re on view now on the first floor.